I have just published the FootRight-Female set of items to the HeroMachine 3 Alpha. I was hoping to translate them to the FootLeft, but frankly I ran out of time before I have to leave for vacation tomorrow. Oops. But, this way you can suggest new items or point out problems and I can fix them when I get back in just one set instead of both. In the meantime, to get the shoe on the other foot (ha ha! See what I did there? GENIUS! ), use the "Multiples" setting and the "Flip" function. Note that I tried something different with this release, putting in feet in different "poses" as well as varying the angle of the foot in different items. I don't know if that's going to work or not, but my hope is that it will allow you more flexibility in designing the layout of the character. As always, let me know what you think in the comments. Hope you like the new stuff! Looks good. I’ll try it out tomorrow – gotta go to bed. I like them, now I can create complete women, heroines and female sidekicks without to manly feet. Yes! The different foot poses are awesome. Allows you to build a character with a completely different ‘character’ with just one small item change. Nice work, dude. You’re off to a good start! Can you please add some flat combat boots and some banded shoes to go with the shiny banded shirt and pants? Maybe you should feminize all the male shoes. Some platform shoes and/or Crocs would be nice, too. It’s brief and simple, but the possibilities are awesome! Also, I can’t wait for the ability to pose the characters on a 3-d level, but that probably won’t be ’til HeroMachine 4 or 5. Can you just imagine the animation possibilities? I also have a few requests if ya dont mind. Now I’m quite curious about what’s coming next. Those all look great! 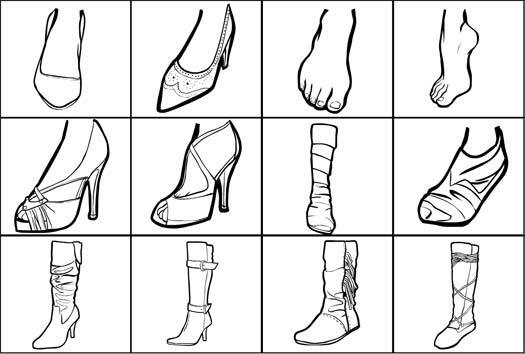 What about one that looks like it covers the entire foot, and goes up half-way towards the knee, like any other boot, but is more form fitting, made of cloth with visible folds and rumples, similar to foot D-2, but not as short, and faces forward, like the boot in C-2. Also, I’ve encountered a problem with the whole of HM 3 Beta. If approximately 18 or more items are added on (I had 3 bottoms, 3 tops, 4 body parts, one head, one face, one hair, one of each side hand, and one of each side glove), and you then delete a part, you can no longer add anything more, and have to trash everything. Just thought I should bring it up. This has happened to me my past 5 visits to the HM3B. I’m not trying to complain, but rather, to inform. Thanks Ritoru. That’s the main bug that has to be worked out. I don’t think it’s a hard number of 18, but rather some other factor related to multiple items and or too much patterning / masking. Well, I had the hands resized and gave them a mild turn, I resized one of the body parts and moved it down from its original placement, and both gloves were also resized and moved from their original placement. Other than that, and some minor re-layering, nothing else was changed. Well, color added, of course. Yah, what I am saying is, it’s random as to when and how it craps out. Sometimes you can go all day and it’s fine, sometimes it’s just a few items with nothing special done and it “loses” one item and it’s stuck there. Very frustrating.